3D printing and rapid prototyping of biomedical models has seen tremendous growth during the past decade thanks to advances in data acquisition, computing processing power, modeling, visualization, and advanced manufacturing. As simple as it may seem, the printing of 3D life-size replicas of anatomical models entails a highly interdisciplinary pipeline that entails image acquisition, image pre-processing, segmentation and smoothing, 3D virtual model generation, numerical testing and model analysis, and finally 3D printing and additive manufacturing. This process entails the synergistic integration of several areas of expertise. The mission of the RIT BioPrint club is to provide an interdisciplinary environment geared at bringing together students from different fields of interest and expertise with the overall goal to learn from one another in a real world, hands-on application environment while also benefiting from partnerships and project-based opportunities with organizations such as the IEEE Engineering in Medicine and Biology Society, RIT PORTAL Lab, Veterinary Specialists & Emergency Services, WNYEnable, and Re-NABLE. 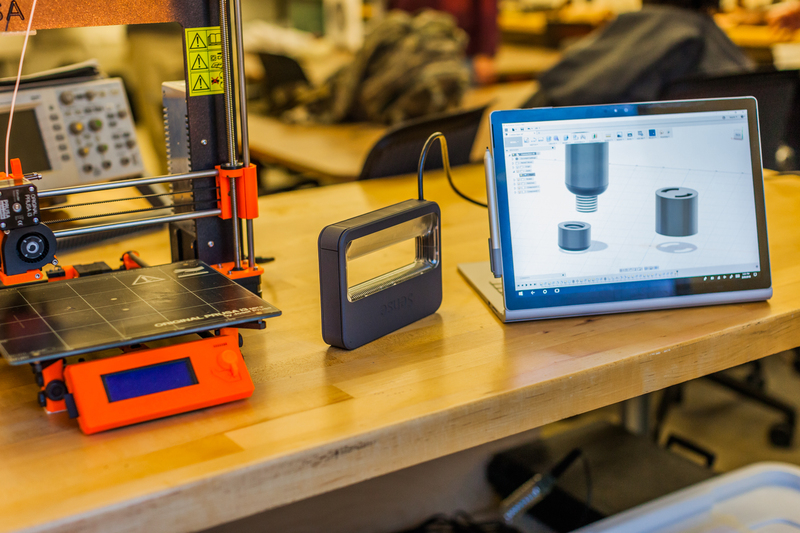 The club will feature three technical areas of expertise – Biomedical Modeling, Design, and Materials Testing; Programming and Software Development; and 3D Printing and Printer Maintenance. The club will operate in a project-oriented fashion to encourage collaboration and productive teamwork, while enabling multiple teams to tackle more complex projects in the effort to increase exposure and identify optimal solutions through joint activities. Upon project completion, teams will present their final designs and prototypes to other teams to receive feedback. Projects will include primarily prosthesis and assistive devices, as well as other biomedical undertakings such as 3D models for surgical planning or modeling different organs. Throughout their membership in this club, students will be exposed to hands-on applications in each of the three technical fields, as well as the opportunity to draw on one another’s knowledge, talents, and expertise, much like in a real-word engineering teamwork environment. Thanks to our partnership with several organizations, club members will have access to exploring future internship, co-op or full-time employment opportunities in biomedical design, modeling, 3D printing and advanced manufacturing. Foster an interdisciplinary, collaborative environment for students with mutual interest in 3D modeling, design, and printing for biomedical applications. This club has two overarching goals: 1) provide students with the opportunity to further their knowledge in disciplines such as 3D modeling and design, 3D printing, and material testing; 2) promote collaboration and teamwork by fostering a venue for small teams focused on specific, yet multi-disciplinary projects. The club will be directed by an Executive Board (E-board) comprising of a president, vice-president, treasurer, and secretary. The E-board will work closely with the Technical Group Leaders – roles explained below – to make all major administrative decisions, define milestones, and seek funding opportunities. The club membership will be organized along three synergistic streams (or Technical Groups) according to their interests and expertise: Biomedical Modeling and Design; Programming and Software Development; and 3D Printing, Printer Maintenance, and Materials Testing. Each group will be led by a student “club veteran” with previous experience in the field. When a project is identified and initiated, a Project Team consisting of students from each of the three Technical Groups will be formed to ensure the expertise needs are met.